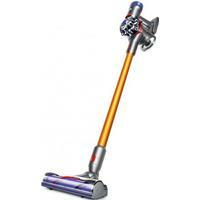 This Dyson sets the bar for cordless vacuums - an excellent model in every way. When you think vacuum cleaners, a handful of manufacturers spring to mind, and the first one is usually Dyson. A brand synonymous with innovative, eye-catching products, they now produce a range of top-notch cordless machines – and the V8 Absolute is one of the best. Finished in orange, blue, and red, it’s a surprisingly versatile bit of kit, offering enough time to clean your house from top to bottom before it runs out of juice. It’s easy to look at the V8 Absolute’s sleek design and dismiss it as a weaker version of Dyson’s corded vacuum cleaners – but you’d be wrong. Fitted with the digital motor V8 and running on a nickel manganese cobalt battery, it creates up to 40 minutes of powerful, no-nonsense suction, with an additional max power mode for the more stubborn tasks. It gets a lot of its oomph from Dyson’s nifty patented cyclone technology, which utilizes 15 cyclones strategically placed over two tiers to capture dust and dirt. Beyond that there’s a superb filter, which doesn’t just collect the dust and dirt, but allergens and bacteria as small as 0.3 microns too. The end result is clean floors, and cleaner air – making the Dyson V8 Absolute a no-brainer for anyone with allergies or respiratory problems. From floors, ceilings, and walls, to awkward nooks and crannies, there’s nowhere the V8 Absolute can’t get to – and that’s not just down to its handy attachments. Weighing in at a mere 2.61 kg, its centre of gravity is situated around the grip, making it easy to lift up and reach high-up spaces. It can also be quickly converted into a handheld hoover, making it useful for impromptu clean ups, or even vacuuming your car. When you’re finished cleaning, the attachments and the cleaner itself all slot neatly onto a wall-mountable docking station – which not only keeps things tidy and out of the way, but charges it for its next use too. Power and versatility isn’t all the V8 Absolute offers – its brush heads pack quite the punch too. The direct-drive cleaner head uses hardy nylon bristles the scrub out stubborn dirt from carpets, whilst carbon fibre filaments lift dust from hard floors. For hard floors there’s also the soft roller cleaner head. Also designed with carbon fibre filaments, it features soft woven nylon, meaning it’s effective for both fine dust and larger debris too. Why you should buy it: Truly one of the best cordless vacuums there is. OK, it's expensive, but if you've got the cash, splash it on this. It excels in such a way as to rival many corded cleaners. A gold star for Dyson here.